In a medium sauce pan over medium heat, bring the milk and salt to a gentle boil. Slowly whisk in the polenta. Reduce heat to low and cook for 5 to 6 minutes - stirring often. Cover between stirs as the polenta has a tendency to bubble and burst (like a delicious volcano) as it thickens. Stir in the brown sugar, pumpkin puree, maple syrup, vanilla, cinnamon and raisins (if desired). Once fully mixed, turn of the heat, cover the pan and allow the hot cereal to set for 5 minutes. To serve, divide polenta among 4 bowls. Top each serving with chopped pecans and a drizzle of maple syrup. Add a small dollop of whipped cream if desired. 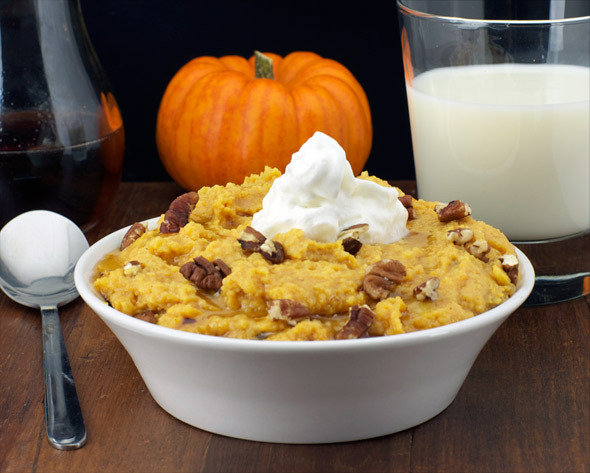 The delicious taste of pumpkin pie in a creamy hot cereal. If you think polenta is only for dinner, think again. Polenta is basically a fancy name for grits - a little finer in texture, but basically the same. Recipe number 3143. Submitted 10/22/2012.